A former medical doctor turned businesswoman. A girl who always follow her heart and find passion in everything that she does. A mother of 3 beautiful kids and a wife to a prince charming. Proud leader to Rich Young Group. Last week Cip buat Lasik.Sebenarnya dah lama saya nak buat Lasik ni iaitu masa menagndung lagi. Tapi memandangkan mengandung tak sesuai untuk buat Lasik sebab penglihatan kita berubah kerana hormon menjadikan ia tidak tepat dan stabil, jadi saya postpone dulu. Selepas berpantang, Cip buat appointment dengan Advance Vision Damansara. Tempat ni tersangatlah popular sebab murah!! Bayangkan buat Lasik untuk RM 2000 plus saja. Murah sangat berbanding tempat lain. Servis juga tip top. Apa lagi nak tunggukan. So, hari yang appointment tu, saya pergi. Ramainya orang. Tapi drg sangat pantas. Duduk 15 minit, dah dipanggil untuk cek penglihatan dulu. Saya dipanggil ke satu bilik, then satu bilik lagi. Ada 2 bilik untuk cek mata ni. Mulanya untuk tahu power mata kita dan satu lagi untuk ukur ketebalan cornea. Takde prosedur yang menyakitkan pun. Hanya melalui mesin saja. Senang. Then, saya disuruh tunggu diluar sekejap. Selepas 10 minit, datang seorang wanita yang menerangkan tentang prosedur. Ada 2 prosedur yang kita boleh lakukan untuk correct vision ni, iaitu Lasik dan trans PRK. Beza kedua ini adalah prosedurnya. Lasik lebih susah dilakukan dari trans PRK tapi recovery Lasik tersangat cepat. Lepas sehari dah tak sakit mata lagi dan penglihatan akan segera nampak jelas. Trans PRK pulak, prosedur lebih mudah, less scary tapi 3 hari sakit mata dan tak selesa. Penglihatan juga selepas 3 hari baru jelas. Jadi korang rasa CIp pilih yang mana? Lasiklah!! SEbab Cip kena cepat recover. Tak dapeklah nak tunggu 3 hari baru boleh buat kerja wehh..
Sehari sebelum Lasik, drg akan cek mata kita lagi sekali. The next day, kita datang dengan suami atau teman sebab kita tak boleh drive after prosedur. Prosedur hanya dilakukan pada hari Jumaat sahaja. So memang ramai gila orang. Sejam saya tunggu que. Agak nervous sebenarnya. Bila masuk dalam bilik prosedur, baring atas prosedur table, ishhhkk seram juga ni. Mula sekali, Dr Wong titiskan air dalam mata. Kemudian, kelopak mata atas dan bawah kita dikenakan macam selitep untuk tak boleh tutup mata. Next, speculum besi kecil dimasukkan dalam soket mata supaya mata kita tak bergerak2 semasa prosedur. Ok agak tak selesa masa nak masukkan ni tapi tak susah pun so sekejap sajalah. Then, pertama sekali Dr akan buat flap. Like satu potongan sket, untuk create satu pintu nak masuk ke dalam mata. Then, Dr Wong letakkan macam ring atas mata kita. Ini agak tak selesa. Yelah letak atas mata, mana ada benda selesa. Tapi sebenarnya tak sakit sebab drg dah titis ubat bius dalam mata ni 2x sebelum start. Lepas letak ring tu, kita bau laser dah. zeeetttttt zeeetttttt. Dr Wong ni sangat gentle dan soothing. Sepanjang prosedur tu, dia akan dok bagitahu dia sekarang buat apa dan cuba calmkan Cip. Cip tersangatlah takut sampai rasa nak suh dr stop saja. Hahahahaha. Tapi Cip duk diam sambil tangan genggam meja bedah tu. Sebab kita awake. Kalau dapat general anesthesia barulah best. Takdelah aku tau segalanya yang berlaku ini. Dr Wong tegur yang Cip tersangat diam. Tidur ke pengsan ke. hahahahaa. Ada ni ha doktor. Dok genggam meja ni. Selepas 4 minit dah siap satu mata. Buat mata lagi satu. Setel. Cuci mata. Siap. Trans PRK pulak tak perlu buat flap tu. Dr Wong remove first layer depan mata tu dan terus laser. Cepat dan lagi kurang step. Tak takut sangat. Tapi recoveryla dok rasa burning sensation kat mata tu. So Cip pilih Lasik. Balik tu, mata memang berair dan dah tak perlu pakai spect lagi. ESok tu bangun pagi dah takde merah mata atau berair. Vision pun dah almost 100% nampak. Best sangat. Tapi tangan ni selalu konfius macam nak buka spect tapi rupanya tak pakai spect. Sebab sebelumni kalau nak tidokan buka spect. Berpuluh tahun dah buat habit nk buka spect tu. Tetiba takde spect pulak. Termalu saja. Untuk recovery, Cip amalkan Carotomax yang kaya dengan vitamin A untuk mata dan Vivix. Dua ni bagus untuk kesihatan mata. Yang penting penjagaan selepas prosedur ini perlu teliti supaya tiada jangkitan kuman/virus yang mengakibatkan komplikasi. So kalau korang nak buat Lasik, korang google saja Advance Vision. Drg ada website dia. Boleh buat appointment melalui web tu. Nanti drg contact u.
Lokasi dia di sebelah Wondermilk. Selamat tak rabun lagi ye. It has been a busy week. I finally have some free time to write again. Monday and Tuesday, we were supposed to be sending Camelia, our 2nd born to a playschool. However due to business workshop for 2 full days, we had to postpone it to today. We have been meaning to send her to playschool for awhile. I believe that it will help her develop social skill, speech and motor skills as well. It didn’t take me long to survey. There are many playschool here near my place. My older child is attending Q-dees but they don’t accept 2 years old. So we went to Real kids but they started accepting 3 years old and above. The last one in Cyberjaya had First Tots. 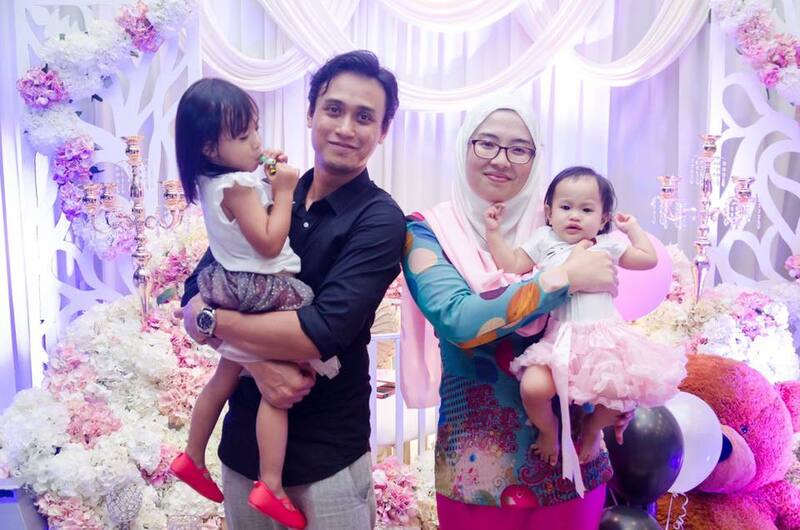 Isabella attended First Tots programmes in Real kids Cyberjaya at the age of 1 year 6 months. But this particular branch only start at 3 years old. I think Real kids is good as they are properly run, clean and well structured. Ever 2 children have 1 teacher. So we went to Brainy Bunch. However the branch near the neighbourhood is quite run down and thus didn’t look clean enough for me. PLusssss they have only 1 teacher in charge of 8 kids from 2-3 years old group. I can’t imagine that. And the truth is that didn’t comply with JKM rules, 1 teacher for 3 children for the 2 years old. This rule is for the safety of our children. How do I know?I actually attended the course by JKM. The Permata course hehehe. I am not sure about the other Brainy Bunch. Perhaps, different branches are different. It was kind of a bump though to see the one near my house like this. I had to look again. I finally remembered this international Preschool nearby. So, we went to check it out. It was huge, pretty and a little bit costly. RM 900 per month for full day. Registration is almost RM 3000. Since Camelia seems to be fitting well at first impression, we decided to go with this. What I love about it is that, it is clean, homely and it separates the kids properly. Since the school is in a big 3 storey bungalow, the kids are well separated in different classes and floors. Thus, the house is quiet and peaceful. I like that peaceful environment. It has a huge swimming pool as well. I feel like attending this school for myself. It looks super fun. Plus 1 teacher takes care of 2 kids of 2 years old. Ok now mommy can breath again. It is English medium and the food is prepared by the teachers. I only supply her bag with diapers and a set of clothes. When asked if she has an allergy, husband said that she cannot stay in a hot place as she becomes red and develop rashes. This child is such a high maintenance tauuu. Thank God for Herbal blend cream. I need to apply this organic cream daily. It keeps her skin soft and clear. Nasib baik cream Shaklee ni murah. The last time I was using the organic cream from Buds.. It was expensive!! Cepat habis plak tu sebab sapu sehari 5x. Jenuh CAP duit ler.. It is just 3 days of trial until 12.30 p.m. We only have to pay RM 200 for 3 days of trial. Let see how it goes. hehehe. Ok, got to go. I have a spa appointment today. Need to refresh myself. By the way, today is my 3rd day post pantang. Need to pamper myself now. Bye. Today is my 40th day of confinement. I really can’t wait to be free, to do whatever I want again without thinking whether this will burden my system. I am so used to being active that confinement really is super boring. Though I am not that strict like most ladies but I do limit myself like cannot window shopping because that would means walking too much. I need to go to Ikea too and Ikea means long walk. During pregnancy, the gaps between your joints expanded a little bit to support your expanding figure. During confinement, the joints are still weak. That is why our ancestors told us to rest, not walk so much, to avoid stairs etc. It is to let the joints rest and not too overburden them during this recovery period. Or you will have joints pain especially at the ankles and knees. You might need to stop wearing heels afterwards temporary. Food wise I avoid those gassy food and oily . Being bloated in confinement is just the worst feelings ever. You will have headache, might vomit and feel pain at the epigastric area of your abdomen. That is why it is best to avoid ‘lemang’ and ‘ketupat’ during the festive holidays. I didn’t have even a bite. I like to insert a lot of salad and tomatoes with rice to keep my nutrients complete. Some people say to avoid certain vegetables as they are believed to be cold food. I personally think that my body is always too warm so cold vegetables will be warmed by my blood circulation as soon as I swallow them. Hehehe. But well nobody follow my ways anyway. This is for me as I know my body and understands it. And I eat seafood, prawns in confinement. No itchiness at all. Patients used to ask me for a list of food to avoid after surgery. They would specifically asked if they should avoid eggs and prawns as they might cause itchiness. Then I would ask if they have allergies to those food? If you don’t have allergies, why would you suddenly develop skin itchiness after surgery??? Surgery doesn’t cause non-existing allergies to suddenly pop. So yeah no need to avoid those food. As a matter of fact, eating eggs is very good for wound healing as it is rich with protein. Protein is super important for healing. Some people go on a strict pantang to the extend the wound didn’t heal well enough. The most important thing is to eat healthy. To balance your diet. This is to ensure that your body and your baby get all the vitamins and minerals needed to function. vegetables and fruits for vitamins and minerals–>immunity, for beautiful skin, thick hair, healthy nails and health overall. dairy products are important as well as they provide calcium. Pregnant mom has supplied calcium throughout the pregnancy to the fetus and during confinement, she should continue to make sure her calcium intake is enough which is 1000mg per day. Imagine after 10 months of supplying calcium to her fetus and she has not been taking enough calcium, her bone will start to deteriorate. PLus during confinement, she is not taking enough calcium and breastfeeding for 2 years. She will start having all kinds of problems later on. Drinking milk alone is not enough to supply 1000 mg per day. That is why if people really think about the importance of all these nutrients for their body and their babies, they will plan their meals more and more than just sticking to 1 type of food everyday. Try to change the menu everyday. If you are in confinement, try to eat healthy other than eating anchovies (ikan bilis) with rice or ikan kering only because those meals are not balanced diet and lack of nutrients. A mother’s breastmilk contains the food that she eats. Therefore, it is very important for a mother to choose healthy food, enriched with nutrients to supply for her baby’s growth. As much as we respect the eldest ways, try to balance with the knowledge of science since knowledge has been upgraded since years ago. But still there are certain truth in the old ways such as rest, keep your body warm, gassy food to avoid, not to lift heavy and etc. And for me I love bertungku, massages and it is compulsory for me to use corsets or girdle during this whole period. Like I said, I balanced the old ways with the science. This is my 3rd pantang and the 2nd pantang with supplements from Shaklee. I use the supplements for pregnancy throughout my whole pregnancy. I could feel the different before taking them and after. I did feel energized and painless during the whole 10 months. No backpain, no fatigue and I was in a great mood since I could continue with my daily routine as usual. I didn’t feel pregnant at all. I even went to Japan at 5 months pregnant. I was super active attending long hours seminars and carrying out daily business plus chasing my active 1 year old plus kid. I believe the complete nutrients I supplied to my body everyday during the whole pregnancy helped my labour. I was in a great condition when labour kicked in. It was fast and easy. Right after delivery, I was still energized. I could continue breastfeeding the whole night and only slept for 2 hours. It didn’t feel like I just gave birth at all. The next day, my parents came to visit and they watched my pink complexion and commented how I didn’t look like somebody who just gave birth. That was the same sentence everybody who visited me during confinement said. I was at home during confinement but active and painless. My wound recovered fast and it was painless as well. Milk was a lot. Other than the fact that I cannot start jogging right away, I don’t really feel like I am in confinement. So personally, I believe that taking enough nutrients is super important for health. It is like supplying good quality of petrol to your car. Imagine running out of petrol while driving?Disaster. So lets stay healthy everyone. Lots of love, Cip. If you need more infos on the supplements that I am taking, you can wasap me at 012-340 0780. Welcome to my new domain. I have encountered too much problem in the old blog http://www.mommysheefa.blogspot.com that I have decided to create a new blog. This will be a new chapter of me. Afterall I am living a new chapter of life. I promise to share a piece of my life regularly here. No matter how busy I get, I will try my best. There is so much that I wanted to share with you that I haven’t shared after lagging in blogging for so long. I am just going to share what is close to my heart and something that makes me smile. I remember the old days when I have never dreamt of owning anything nice at all. I mean, I took a peep on those luxurious things but well they were not life and death important in my life. There is kids tuition, nurseries, mortgage and life expenses. But deep inside me, I made a wish that if one day when I can afford everything, and be able to save my earning to the extent that I have nothing else to do with the money, then I am worthy of an expensive handbag. I know people can afford the bag easily. For me having to pay so much for a handbag and having left only 10k in a saving is not an intelligent idea for me. It is just me. I believe in building my family economy more than anything. Buying a luxurious handbag and making more credit card debts you can’t afford is a bad idea as well. When I buy those bags, it means I really can afford them. They are for me and my satisfaction. Not for others. They meant I have made it to another step. So one day in last year, I finally could afford an LV. I asked my husband to take me to The Garden. I walked into LV boutique. A well dressed man approached me. And walla I made a purchase for Delightful LV. My husband rolled his eyes at the price. My first bag is a symbol of my own achievement. So it must be purchased by me. Not a gift. Since I was in a good mood, I offered to buy him an LV belt which he turned down after learning about the price. As I walked out from the boutique, holding this giant orange paperbag in my hand and another hand holding my husband’s hand, I was a little chatty and giddy. I told him about this young girl who was so positive in life. She was in medical school and she loved fashion. She loved tabloids too. hahaha. I was really upto date on Hollywoods and the it girl. Now no more. Life kicked in. Who has the time right? Anyway, I was so sure that I could afford these beautiful things that I have been following relentlessly. Afterall I was going to become one of the blue collar profession right?Don’t they say ‘jadi doktor kaya’? And then reality happened. So no bag. Couldn’t afford it. So yes people, dun be a doctor just to be rich but do it because of passion. Whatever work that we want to do, we must find passion. Not that I am saying I left the profession because I couldn’t be rich. It was just I found my passion elsewhere. That’s all. So back to my story. I told hubby that one day when I could afford this bag, it means I made it to another step of my life. Managing to buy a Beemer never made me feel giddy like this. Because you see, car was not part of that young girl dream. Bags were part of it. So there it was a dream of a young girl and she worked really hard for her life. She deserved a little gift and another gift later on(rolled eyes). This bag is smaller but it fits my collagen so I am satisfied. Well I love it!!! But my point is, to never forget your dream. Go chase it. Make it happen. Nothing beats the feelings of making your dream comes true. Yes! !It is the best feelings ever. Graduating med school never felt this way for me. I guess that was a question of passion again. So I wish you luck in every dream that you have. And I’ll see you again soon. Bye.